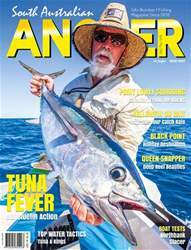 Our April/May issue covers a diverse spectrum of fishing experiences and useful information. In the ‘how to’ department, B.G. Fischer explains how to maintain your rods and reels, Lubin Pfeiffer offers his views on surface fishing for large pelagics, Jamie Crawford looks at the majestic queen snapper, and Shane Mensforth takes a step back in time to revisit catching yellowfin whiting on bait. In the ‘where to’ department, Peter Knott takes a look at Black Point as a holiday venue and Casey Mattson tells us all about calamari catching at Whyalla’s Point Lowly. We cook a superb chilli crab with the Largs Pier, test boats from Stacer and Northbank, and showcase a heap of new tackle. Don’t miss a word of it!